Dip each ball into melted butter then toss into the freezer bag and shake everything together or dip each ball into bowl, coating well. Turn off slow cooker, and allow to sit uncovered for 5 minutes, then run a knife around edge of slow cooker and transfer monkey bread onto separate serving plates. 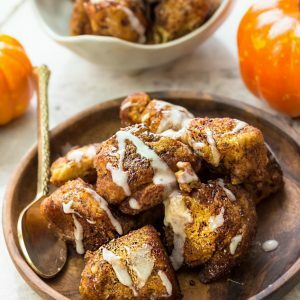 (Do not leave remaining monkey bread in slow cooker). Top each serving with syrup or favorite cream cheese glaze if desired.